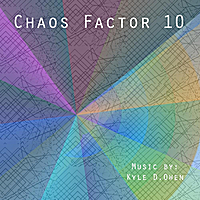 First Single: "Chaos Factor 10"
My first single is out, and it is called "Chaos Factor 10"! It was released through CD Baby, and is now available on Amazon, Spotify, Last.FM, and soon iTunes. This is my first 'break' into music distribution, and I wanted to do it with something a little outside my normal work. This is an example of chiptune music, and was generated with a software instrument that I used, modified, and sampled. I am in the process of getting ready to master my next CD, which will be based on the Game music that I've released so far. It will also be available on CD Baby, iTunes, Amazon, and others. This piece is available for download through CD Baby for $0.99c, or on Amazon for $0.99c. As it becomes available on iTunes, I'll post the links here. Pricing may change on CD Baby, but because it is the service I released it through initially, it is priced differently there. If you like it, please buy and help support my work. I have several CDs in 'planning stages' right now, that I hope to get out within the next year. I've been sitting on some of my music for too long, and I want nothing more than to share it with those who may enjoy it. It does nothing sitting in a folder, and sharing it is the best thing I can do. Below is a list of places it will show up, if it isn't there already. It takes some time to populate into each companies database, so if you are looking for it in a specific store, and it isn't there, please check back or send me a message and I'll let you know if it is scheduled to be released through that service. I hope to release my "Game Music" CD in January 2013, where I'll have all the game music that I've done so far. Including music that I licensed for previous projects, and other Game Music that I've done that was unreleased. It should be a great collection of music that I either have used in games, or could see being used in games! I've been designing my Album Artwork now, and mastering some of the tracks, so it can be on schedule to release on time. I'm very excited about this project, and can't wait to share it with everyone!